Meanwhile, the Cornish Roc Xs and Freedom Rangers got separated into their new homes. Here are the selected Cornish Rocs in their 'transportation box' - ready to be dragged across the yard to their new coop. Yes, we let our children outside in pjs. All the time, folks, all the time. Can you stand it? Heck sometimes I muck stalls in the morning in my PJs.. doesn't everyone? JDaniel so wants to come to live at your house! I don't think I love anything more then a little one in their pj's outside, in the car, on my lap, well...anywhere! 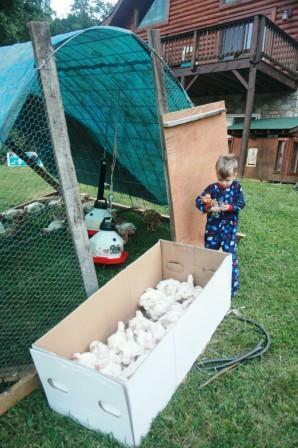 I bet the chickens are lots of work, but they certainly look fun! Pjs? We live in them! Are we not suppose to go outside in our sleep wear? OOPS Oh well to late, I am not changing my ways at this age LOL. I do lots of stuff in my PJs..and the boys actually look adorable in theirs! heck, why bother with the pjs at all! You've not taken delivery of an Ostrich by mistake have you Lisa? 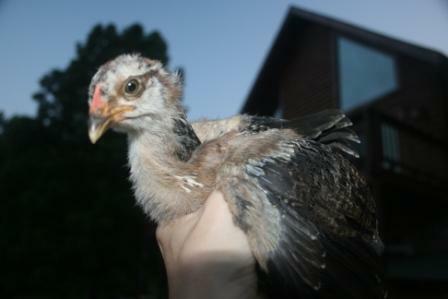 I think it is so hard to tell chicken breeds when they are young. I do tend to agree with the person that said it looks like a turkey though. I agree with Valerie--maybe Frida could be a turkey. Sounds like perfect timing for Thanksgiving, but I don't know if I would enjoy eating a turkey that I'd named! And we always live in PJs! We go out in our jammies, too. I am so seriously considering chickens here. Mystery chick indeed! I'm curious to see what you'll end up with! Good for you letting the kids play in their PJ's! They're having fun! Maybe it IS a turkey. I can't wait til you post a photo of her when she's bigger! She looks like a turkey to me. Shows you how much I know. Frida is CUTE!!!! And, I totally let my kids wear PJ's outside, haa, alll the time. I agree with those who think your mystery chick looks like a turkey. You know, you could have a turkey there, but like you said... time will tell. My daughter loves to ride her bike in her pj's and she is now ten years old. Gotta love living in the country! 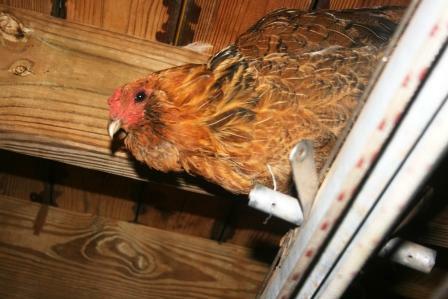 lol We received a mystery chick once that turned out to be a Polish Chicken. Always interesting. Nothing wrong with going outside in your pjs! You are right - time will tell. And I stay in my PJ's too sometimes! What an awkward looking little hen! I hope she ends up looking like Natasha! She is beautiful! My son thinks he should be in his pj's all the time! lol He even wears them out in public when I let him get by with it. As soon as he comes home from school he changes into his pj's! lol It isn't something that I made him do either. He just likes being in his pj's. I can't think of anymore delightful than running around outside in pj's. (and not having neighbors close enough to see me and have me committed.) the chicken transport house looks awesome! PS-E-mail me your address. I was serious about sending you something for being my 400th follower! Hahaha! I let my kids out in PJ's all the time too! No harm in that!